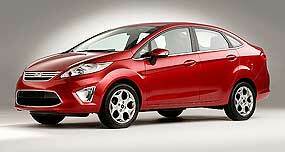 The new Ford Fiesta will be rolling off the Eastern Seaboard production line very soon. Its sibling, the Mazda2 is already coming off the line in small numbers, and the latest Fiesta news from the Los Angeles show was that it will be offered in a dual-clutch transmission with a 1.6 liter engine. Duel Clutch should not be confused with dual plate clutches. In a standard manual gearbox there are usually five gears and one clutch to split the transmission from the engine torque input. A dual-clutch gearbox, by contrast, uses two clutches. Instead of the left foot clutch pedal, sophisticated electronics and hydraulics control the clutches, just as they do in a standard automatic transmission. In a DCT, however, the clutches operate independently of each other. One clutch controls the odd gears (first, third, fifth and reverse), while the other controls the even gears (second, fourth and even sixth - in a six speed). Using this arrangement, gears can be changed without interrupting the power flow from the engine to the transmission. DCT is then truly an automated manual transmission. In principle, the DCT behaves just like a standard manual transmission, in that it has input and auxiliary shafts to handle gears, synchromesh rings and a clutch. What it doesn’t have is a clutch pedal, because computers, solenoids and hydraulics do the actual shifting. Even without a clutch pedal, the driver can still ‘tell’ the computer when to take action through paddles, buttons or a gearshift lever. In other words, manual over-ride. For traditional manual gearbox exponents, slick shifting with left leg depressing the clutch is supposedly very possible and very fast. However, with DCT, no left leg or left hand is needed and it can do upshifts in a mere 8 milliseconds, and many drivers now feel that the DCT offers the quickest acceleration times of any vehicle on the market. It certainly offers smooth acceleration by eliminating the shift shock that accompanies gearshifts in manual transmissions and even some automatics. Best of all, it affords drivers the luxury of choosing whether they prefer to control the shifting themselves or let the computer do all of the work. And in most instances, the computer knows best! With the world’s attention on fuel economy, perhaps the most compelling advantage of a DCT is a claimed improvement in economy. Because the power flow from the engine to the transmission is not interrupted followed by a call for more fuel by the engine, fuel efficiency increases dramatically. It is claimed that a six-speed DCT can deliver up to a 10 percent increase in relative fuel efficiency when compared to a conventional five-speed automatic. That is impressive numbers! Ford call this their Powershift dual-clutch gearbox co-developed with transmission specialists Getrag, the six-speed Powershift will be the ‘automatic’ gearbox alternative to the standard manual transmission when it goes on sale in North America in the middle of next year. Powershift is also set to make its way on to other Fiesta models sold elsewhere in the world, including the Thai built Fiestas. It is the first gearbox alternative to the five-speed manual offered with the 1.6 liter Ti-VCT four-cylinder petrol engine. The recently released Fiesta Econetic diesel is also in line to go to the dual-clutch option sometime in the future. This all makes good sense as the dual clutch set-up does also save fuel. Last week I asked who made this electric car? The year was 1978. It was Volvo. So to this week. Take a look at the picture of this motorcycle. 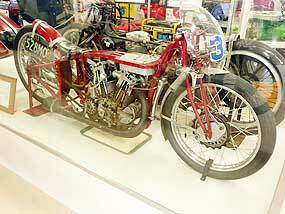 It is very famous and a world record holder. What was the rider’s name? Kimi Raikkonen’s future in F1 has taken a set-back. With no team willing to meet his salary demands at the end of 2009, he has taken his helmet and gloves and will be seen at the wheel of one of Citroen’s Red Bull-backed junior team cars in the 2010 World Rally Championship (WRC). Raikkonen, whose Ferrari seat has been taken by Fernando Alonso for next year, has signed a one year contract with Citroen and has not ruled out a Formula One return in the future - though only if it is with a team with title-winning potential. The 2007 F1 champion did not impress anyone in 2008 and 2009. In fact he was considered to be so much of a hindrance to Ferrari, the Scuderia bought him out of his contract with still 12 months to run. You don’t do that with a much wanted employee. Since that would be the longest string of sentences Raikkonen has ever put together, I have the more than sneaking feeling the statements were crafted by Citroen and Red Bull’s publicity office. However, with a new hat (and please get him one that fits) he may have his enthusiasm renewed, and return to F1 in 2011. But I somehow doubt it. 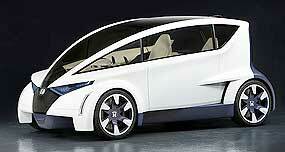 Honda released their Personal-Neo Urban Transport concept at the Los Angeles show in December, known by the acronym P-NUT. Following similar urban concepts from Nissan (LandGlider), Renault (Twizy) and Volkswagen (L1), the P-NUT is a three-seater (driver in the front middle, passengers at the sides rear), rear-engine rear-drive vehicle claimed to be able to accommodate a number of potential powertrains, including a conventional internal combustion engine, petrol-electric hybrid or full battery-electric. 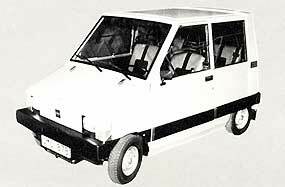 While the P-NUT is a long distance from a production line, Dave Marek said it demonstrated that ultra-compact cars in the future would be far removed from current models. “The objective of the exterior and interior designers was to explore the potential for a new type of small-segment category vehicle that overcomes many of the objections for existing micro-car designs,” he said. “While the Honda P-NUT concept introduces function-oriented concepts, it also shows that small cars don’t have to compromise on style or amenities.” But I think you’d have to be a bit of a peanut to want one! GM vice-chairman Bob Lutz (“Global warming is a crock of sh*t!”) has come out in his address to the Los Angeles show saying that by making consumers pay more for their petrol or diesel is probably the only way to ensure the successful mainstream take-up of electric vehicles. He argued that a palpable financial incentive was the only real way people would be encouraged to take the leap into electric vehicle ownership - especially in difficult economic times. “One of the prime things that has to happen long term for any of the expensive electrically driven technology to have a true commercial success as opposed to a novelty success (or convincing the public to) make a true financial sacrifice in order to protect the environment, so the cost effectiveness of the technology has to improve. “And a hindrance to doing that is low gasoline prices. Like it or not, they are on a tight budget, and they are not going to pay ten of thousands of dollars more in order to save hundreds of dollars a year on gasoline - they will not. “So, over time, if the country is serious about cutting back oil consumption and reducing petroleum’s impact on the environment - what we are going to have to do is gradually increase the federal taxation on fuels. When my husband and I arrived at a car dealers to pick up our car, we were told the keys had been locked in it. This was at the Ford dealership in the Australian country town of Dubbo. Mercedes-Benz and McLaren have officially divorced and the final SLR McLaren-Mercedes will be finished soon. However, that does not mean the McLaren and Mercedes-Benz have finished building supercars. Shortly after McLaren Automotive unveiled the first photographs and official details of its new MP4-12C coupe, Mercedes-Benz has replied with a full range of details on their new SLS. Not since the 300SL of the 1950s has Mercedes-Benz produced a model with roof-hinged ‘gullwing’ doors - and never before, in four decades of turning out high-performance vehicles, has the Mercedes-AMG division developed a vehicle from scratch, in-house. Both supercars are expected to be priced from around half a million dollars when sales commence, although for McLaren this will not occur until at least 2011. The SLS, on the other hand, enters production in the coming months by June 2010. 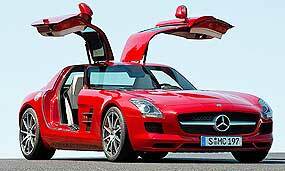 The SLS features the iconic gullwing doors, Mercedes’ first-ever aluminum space-frame body, a dry sump 420 kW 6.2 liter AMG V8, seven-speed dual-clutch automated manual gearbox (another Benz first) in a Ferrari-style rear-mounted transaxle, 47:53 front/rear weight distribution for the front/mid-engine chassis layout, aluminum double-wishbone suspension, provisional 0-100 km/h acceleration of 3.8 seconds, making it a real supercar, with supercar performance. However, it is becoming a crowded market niche, including the Ferrari 458 Italia and Porsche 911Turbo.